SA cattlemen increasingly recognise the Afrikaner’s competitive advantage, says Barry Steenkamp, co-owner of the Palmietkuil Afrikaner herd in the Vredefort area of the Free State. Annelie Coleman paid him a visit. The Palmietkuil Afrikaner farming enterprise is based on maximum meat per hectare, says Barry Steenkamp. The Afrikaner was a popular breed in the early days of cattle farming in South Africa and Afrikaner genetics form the basis of many of today’s synthetic breeds. 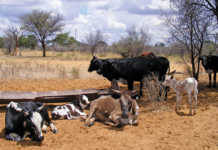 The introduction of cattle breeds from abroad and the development of synthetic breeds led to a gradual decline in the numbers of Afrikaner cattle. However, with the focus of beef cattle shifting towards adaptability and productivity, father and son team Dirk and Barry Steenkamp see this hardy breed as the breed of the future. The Afrikaner is as competitive today as it was in its glory days,” says Dirk, whose father and grandfather were also Afrikaner breeders. 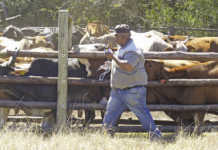 The Steenkamps run Afrikaner, Bonsmara and Santa Gertrudis cattle, as well as grow maize, on their farm in the Vredefort Dome area in the northern Free State. 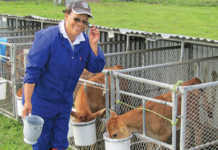 The Afrikaner component produces 43% of the livestock turnover in the business. “We farm three breeds so that we use the right breed for the right job, so to speak,” Barry explains. “As a theoretical example, for maximum milk production we would use Holsteins, for the highest butterfat content, Jerseys, and for smaller-framed animals, Dexters.” Barry says that the future of beef farming lies in using the right breed for the conditions. “We need to know the areas we farm, and the strengths and limitations of the cattle,” stresses Barry. “A farm can contain bushveld, rocky outcrops and grass plains. To us, it makes sense to use three different breeds because of environmental diversity on our farm,” says Barry. The soil varies from sandy to sandy loam to heavy clay and there are rocky outcrops in the hills of the Vredefort Dome. Temperatures range from -6°C to 43°C and the average annual rainfall is 575mm. The area represents elements of two veld types: Bankenveld (Acocks) and Cymbopogon-Themeda veld (Acocks) with Eragrostis plana and red grass (Themeda trianda) as dominant grasses. The Steenkamps stock at 4,5ha/ MLU to 6ha/MLU. 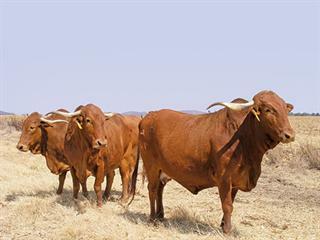 Afrikaner cattle graze the hilly part of the farm during summer and utilise maize stover in winter. These animals are suited to the steep hills and koppies of the Vredefort Dome, according to Barry. “The cattle can climb the steep hills without strain and make the best use of grazing.” says Barry. “We can use the farm’s full potential.” Afrikaners easily walk the 6km between watering points when required to do so. Some camps have wetland areas but water is supplied mainly by boreholes. The breed’s hardiness, thick skin, short-haired coat and parasite resistance make it ideal for the more rugged areas of the farm. Afrikaners have an inherent resistance to ticks and endo-parasites, which means less dipping and treatment against tick-borne diseases such as anaplasmosis and three-day-stiff sickness. “We inject the herd with Multimin and products containing avermectin, a broad-spectrum anthelmintic with insecticidal properties, twice a year,” explains Barry. “In winter, animals are treated with pour-on pesticide, and in summer they’re spray-dipped when necessary.”Cattle have a phosphate lick in summer, and a protein lick in winter, while young animals have access to a production lick. The Steenkamp family. Front from left: Barry’s mother Miekie and wife Mari-Lise. Back from left: Dirk, daughter Marieke and Barry. A few years ago, a leopard killed several calves on the farm. Only one was an Afrikaner calf, however, due to the protective nature of the Afrikaner cows. The rest were Bonsmaras. “One reason we prefer horned Afrikaners is that the horns help in defence and keep predators at bay. “On one occasion when we moved the herd about 22km away by truck we inadvertently left a calf behind. Its mother walked back during the night and was reunited with her calf in the morning,” recalls Barry. Weaners of all three breeds are put through the feedlot before being sent to slaughter. The Steenkamps also supply Afrikaner beef to a local butchery at a premium price. The meat is highly sought-after because of its exceptional marbling and tenderness. Virility is a strong trait in Afrikaner bulls. “One of our bulls had a take rate of more than 93% in a herd of 60 cows for four consecutive years. This keeps the investment cost in bulls low, and combined with the Afrikaner’s longevity, increases the profit margin.” Dirk and Barry are in the process of registering an Afrikaner stud as an investment in and contribution to Afrikaner genetics and the breed’s development in South Africa. They are currently selecting animals for the stud from the existing herd.